I don't write reviews for every book I read, mostly I don't talk about the bad ones and though this wasn't a bad book, it wasn't anything to write home about either. However I wanted to mention the wonderful structure of this book. It looks at the mysterious death of a girl firstly from her own past, including social media snapshots and her mother, the lawyer trying to come to grips with the fact that her daughter might have committed suicide or was killed. This mother daughter dynamic was strong but juxtaposing the past and present, illuminates those doubts that we all have at the death of a loved one because who knows anyone really? Going through their belongings, writings is a mixture of comfort and fear; relief at the familiar and distance at new things all shrouded in the fear that you'll stumble across something you don't want to know. 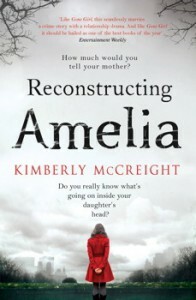 Personally I found it such a poignant read because the more I got to know Amelia the more I liked her, her way of thinking so that it pinches you everything you remember she's dead. The pace is fast and Kimberly McCreight doesn't treat you like a idiot needing to be spoonfed everytime. There's a good amount detailing so that it wasn't a frustrating or boring read. The ending kind of dipped but I didn't regret reading it. Not a bad way to wile away the office commute.